Several of our favorite funnymen are taking on new roles -- as famous Disney characters! 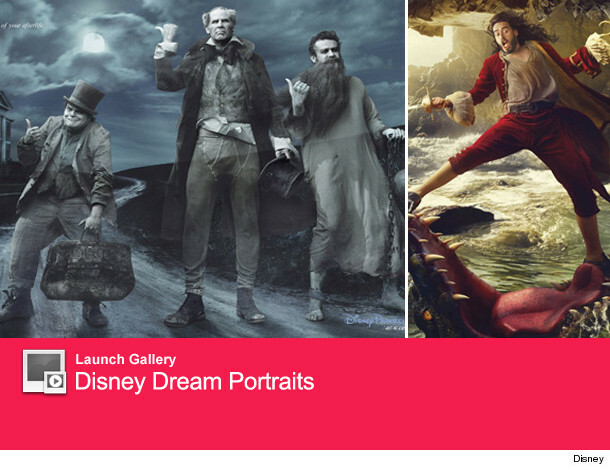 In two new images for the Disney Dream Portrait series, Will Ferrell, Jason Segel and Jack Black transform into the famous Hitchhiking Ghosts from the Haunted Mansion ride at the Disney theme parks, while Russell Brand does his best Captain Hook impression. The photos, taken by legendary photographer Annie Liebovitz, will be featured in upcoming issues of GQ, O Magazine, People, Vanity Fair and more. The hysterical dudes join a long line of celebs who have portrayed characters in the campaign for the Mouse House, including Penelope Cruz, Scarlett Johansson, David Beckham and Beyonce. Click "Launch Gallery" above to see all of the shots, and watch the video below for a behind-the-scenes look with Will, Jason and Jack! Exclusive With Will Ferrell and Zach Galifianakis on "The Campaign"! Jason Segel and Matilda Ledger Take a Stroll!